The gut instinct told me what I was holding was in fact a tarot deck. It’s a clean white cardboard box, just about the right size to fit in a pack of cards. Inside it, however, there is a cassette inside the normal cassette box, with obscure, occult ornaments as its art work. “I wasn’t that far from the truth, then”, I think to myself, and then again, I did not order any tarot deck and it was mentioned on the envelope that this is, in fact, a package for music review, so I wasn’t at all surprised. 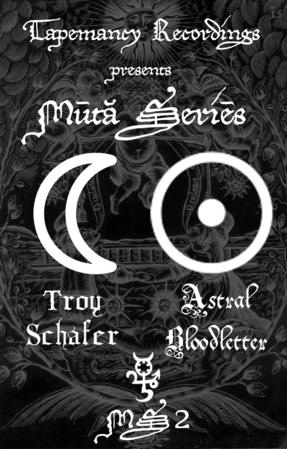 Astral Bloodletters (Evan Clucas and Joel Shanahan) and Troy Schafer share an enchanting mini album with two magical musical conjurations. Sometimes you hear the darkness taking its hold over the soundwaves, sometimes it is hope instead. The result brings shifting winds of spiritual charge, form the breathing, massive build up of “A Fly in Amber” to the bleak, wonderful descent of “When the Sun Speaks”. The format of this album is fitting. This eternal light versus dark conflict is sampled and presented on a magnetic tape that is endlessly (let’s hope) looping its way on the tape player. When the harsh, dreadful voices of Astral Bloodletter (it’s a great name as well!) ends, Schafer’s monumental rise begins. The first showed a dirty, minimal at points, dark passage, while the second present the infinite adding of more and more layers of tense musical figures.